Val's Puppy Care Center was about three years in the making, including a full year of planning alone. As Best Friends' CEO Gregory Castle explained in his opening remarks for the ceremony, "This building will help save lives [and] will bring us closer to a day when there are No More Homeless Pets." The first stop for new pups at Best Friends Animal Sanctuary will be The Enrietto and Kallas Foundation Puppy Admissions building. This space affords a safe place for new pups and moms to receive their vaccines before seeing the great wide world. The second building, The Laurie and Carlee Mc Grath Puppy Preschool, is where the puppies move when they're ready to meet new people. It's here they will truly learn the ropes of life. This two-building setup has all sorts of bells and whistles from top to bottom. There's radiant heat in the flooring, passive solar design, thermal heat exchange, epoxy floors, and on and on. Even so, every detail was planned and built with one important goal in mind: "We want to focus on socializing," explains Best Friends animal care director Patty Hegwood. Makes sense! These puppies need all the attention and interaction they can get. This is why every possible strategy has been used to make these buildings not only gorgeous and highly functional, but a breeze to keep sterile and safe for the puppies. That leaves more time for the serious business of playing. 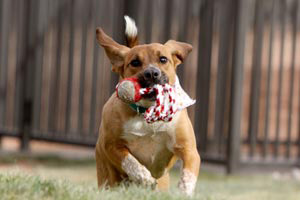 Proper socialization can mean the difference between a first-time forever home and a string of forwarding addresses. That's one big way in which lives can be saved through this new center. For the festivities, twelve pups were ready to walk through the ribbon and enter their new lives in the puppy care center. Their names are: Ferrari, Triumph, Lexus, Benz, Porsche, Cadillac, DeLorean, Beamer, Butter, Jelly, Dell, and Christian. 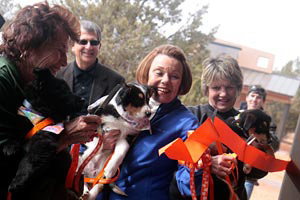 Each puppy was sporting an orange leash held by a special donor. All twelve puppies walked through an orange ribbon after the official ribbon-cutting, to the cheers of the crowd. Inside, cozy as could be, the puppies settled into several of the seven available "puppy apartments." Those in attendance were then treated with the very first puppy socialization class in the new building. Best Friends' dog trainer Ann Allums picked puppy sisters Lexus and Beamer for the demonstration. Ann began by explaining some of the goals in the class. Dogs who are not confident with new situations can become startled easily, especially if they haven't experienced a variety of new situations when they were young. As such, one main goal in the class is to expose them to all sorts of different sights, sounds, noises and so forth that they'll encounter in homes later on. During the short demonstration, the puppies were handled by volunteers, heard a doorbell, crawled through a tunnel, listened to a flute-like whistle, and even got to say hello to Ann while she donned a motorcycle helmet with tinted visor! All along, they had treats with each little success, thus teaching them from the beginning that new things don't have to be so scary. Basic obedience is also covered in the class. The class will be taught by Dogtown staff on a daily basis, and volunteers are encouraged to attend. Which brings up another great benefit to the whole setup: Those who attend the puppy classes not only teach the puppies new skills, they themselves can learn a great deal about the importance of proper puppy socialization. They in turn can take what they've learned back to their communities and shelters, saving even more lives. The festivities concluded with a toast, given by Gregory, "To all the lives we will save with this wonderful facility." Now that's something worth celebrating. Best Friends Animal Society would like to thank all of our donors who helped to make Val's Puppy Care Center a reality. We'd especially like to thank the following people and organizations for their generous support. Your gifts will live on through the lives of these special needs dogs and the many thousands more who will benefit from the modeling and teaching that will reach out across the world from here.